Arrived in Koscielisko, I ascended a hillside, and, after an hour's inquiry, found lodgings in one of the few houses scattered on the south slope of a moun­tain. From here we could look down into the Zakopane Valley at our feet, and across to the imposing chain of Tatra, with its tremendous granite walls, its many peaks veiled in clouds, and its foot­hills covered with black-spruce forests. As children we had looked on these mountains, believing that they marked the outer edge of the world to the south, and even now we doubted if Hungary could really lie beyond. Nearest of all the peaks, and facing my window, stood Gevont, with its shiny, precipitous gran­ite cliffs in front of a long chain of sum­mits that disappeared in the east in lumi­nous haze. There was where the sun was wont to rise and force its rays through gaps in the clouds that never leave their perches on Tatra's peaks. The house in which I decided to stay belonged to Jan Naziom Stopka. It was surrounded by ash-trees that in autumn protect it against the violent winds from the mountains, and, like all the houses of that region, was a simple, solid structure consisting of two very large rooms, each with a small window facing Tatra. It was built of heavy spruce logs, planed on the inside: the interior had become a dark, reddish-brown from the smoke of the family fire. A quaintly ornamented door led from the small porch into a hall that separated the two rooms and rose to the dark interior under the high roof. An enormous whitewashed oven of com­plicated construction occupied a large part of one of the rooms. On the carved wooden shelves were groups of earthen pots, pitchers, wooden spoons, and a big stone mortar, which, one would think, might have belonged to a prehistoric age. The barn that formed a right angle with the dwelling-house, built with equal care and solidity, was a sort of Noah's Ark, giving shelter to horses, cows, pigs, geese, and chickens, each kind in separate compartments. In the middle was a wide threshing-floor; in a corner, on wooden blocks, was a very primitive apparatus for grinding grain, called a zarna, consisting of two heavy disks of stone, with cut faces, of which the upper one could be put in rotary motion by means of a long pole attached at one end to the stone, while the other turned loosely in a hole in the ceiling. The very high roofs of both buildings projected several feet over the board walk that ran around the walls. Under the ash-trees shone the white awn­ings of a heavy vehicle, while plows, wooden harrows, pitchforks of beech-wood, and other primitive agricultural utensils leaned against the walls. Wooden vessels of various shapes and uses stood in row on the board walk, all cleanly scrubbed by the thrifty wife. Bleaching on the closely cropped lawn were pieces of home-made linen and wide-sleeved shirts. Small pigs, geese, and chickens swarmed in the muddy yard. Pastures dotted with a profusion of flowers, and fields of oats, potatoes, clover, and flax, surrounded the home­stead and covered the slope between two deep ravines, hidden under spruce forests, where two little streams in many cas­cades rushed down under the tangled roots of spruce-trees, large leaves of pod­bial, and blue myosotis, over slanting strata of slippery slate, then among whit­ish granite boulders. Lower down they joined in one torrent that at the sluice formed a deep pool where on hot days little boys and girls, like fauns and nymphs, splashed in the crystal water, causing dismay among the darting trout. 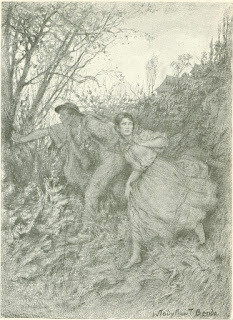 Then the stream jumped over a rattling mill-wheel hidden among trees, and down the inclines, through woods, glens, and grassy slopes, until it reached the river winding in the spread­ing valley below, where followed in pro­cession pale-green fields, marshy meadows, groups of trees, and houses with roofs shining like silver. Here and there smaller streams, coruscating in the sun­light, hurried to meet the river, rushing over boulders, and followed by the whit­ish road that connects village with vil­lage. Toward the south a black-spruce forest, with only an occasional clearing, stretched away for miles, and covered the foot-hills of the always mysterious Tatra. 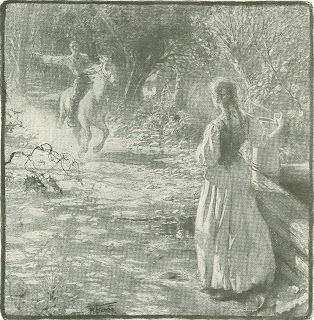 At a moment when from the near-by ravine came the tinkle of cow-bells min­gling with the rustling of the stream, a song would arise, sometimes with a mel­ancholy note and again with primeval rapture. Soon black-and-white-patched cattle would emerge from the ravines, followed by orange-kerchiefed shepherd­esses. Two of the girls with their small cattle passed my window every evening. One of them was Ulana, daughter of our neighbors. She was a slender girl of about fifteen years; her erect figure was enveloped in a coarse linen shirt, a red­dish embroidered sheepskin serdak, or sleeveless jacket, and an indigo-blue skirt. An orange-yellow handkerchief was bound tight around her face, with its high cheek bones, full, rosy, shiny cheeks, and blue eyes truly Slavonic, which, from under a scarcely perceptible trace of eyebrows and thick flesh covering the lids, margined with dark eyelashes, shone like stars. She would run around the cows, and shouting "Tse, tse, tse!" would jump to the right and left after some skittish calves that were wont to run into the oats and clover fields. Another was a plump, flaxen-haired lass. Like most Podhalan girls, both were timid: when passing a strange man they would cast down their eyes; but they could not help blushing and smiling. Love, jealousy, and hatred have full sway in the hearts of these simple daughters of Eve, not void of strange whims and odd coquetry; but for frivolities lit­tle time is left to them. They have to busy themselves with all kinds of farm la­bor, and I even saw them mending roads. When they are still very young, about the sixteenth year, most of them marry. In comparison with the well-built, hand­some men of Podhale, the women are small, and the charm of youthful fresh­ness soon passes from them. 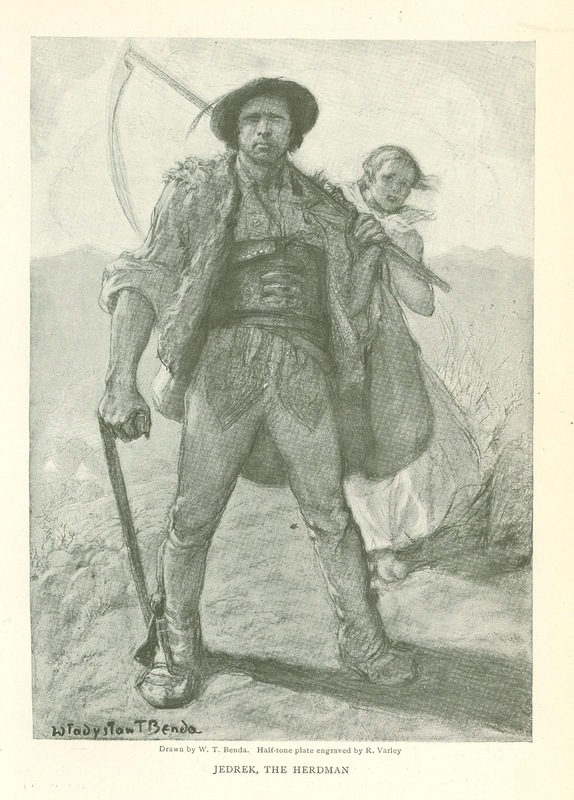 The wide difference in stature between the man and the woman is characteristic of the Sla­vonic race, and it is even more than usually marked among these mountain­eers. Ulana's brother Jedrek is yuhas, or herdsman, in the "Valley of Five Lakes," in the heart of the Tatra range. There, in the great solitude of the valley, empty of all life, he stays all summer with his flock of sheep. With them he travels all day over precipitous, rocky ridges full of threatening crevices, over wide areas of snow-fields, through narrow gorges, to find the scanty grass that grows wherever a little earth has filled the cavities and fissures of stone. Half the time drenched with clouds of rain, he is always ready to fight off a bear, or a Liptak, his Hun­garian neighbor on the southern slopes. He rarely comes to his house on Sobic­kowa to bring cheese and bryndza, or fermented, crumbled sheep cheese. He is a rugged fellow, rather big for a moun­taineer, muscular and alert, and scant of words. His rough, weather-beaten coun­tenance, with two deep, parallel scars across his nose and high cheek-bones, shines with deep-set, wolfish eyes, squint­ing from under his mushroom-shaped hat, shiny from frequent contact with milk and butter, and commonly surmounted with an eagle's feather. Over his coarse, wide-sleeved linen shirt, which does not reach his waist, a big ten-inches-wide belt of three-ply cow­hide, ornamented, and weighing over fif­teen pounds, encircles his body like an armor, and shines with four large brass buckles and many brass and silver gew­gaws, which jingle at his swaggering gait. A shaggy sheepskin serdak, with long, yellowish wool, covers his back. On his tight woolen trousers, patched and darned at the knees, there had once been blue and red embroidery, now mostly rubbed off. Jedrek was a typical yuhas, and a yuhas is the nearest type to the now dispersed zboiniks, or Tatra brigands. His great vital power, and his intense passion, in­sufficiently controlled by reason, often bring him into fights that frequently end fatally, for he always carries a sharp ciupaga, or tomahawk-like ax. In Po land, which is a typical flat country, with only one chain of mountains rising ab­ruptly at its edge, the difference between the mountaineer and the lowland type is most striking. 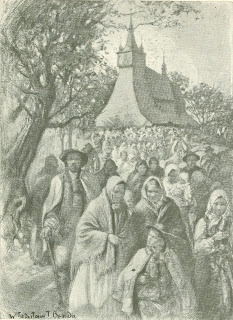 The gorals, or mountain­eers, as little resemble the Polish peasants of the plains as do the lofty mountain re­gions the wide, level fields of Sarmatia. The ravine of Sobickowa, which is a favorite rendezvous for lovers, has an eventful history, and there fierce trage­dies sometimes break the monotony of cow-bells and melancholy songs. Goral fantasy and superstition readily turn nat­ural happenings into myth and poetry. One late afternoon, while resting under a juniper bush at the edge of the ravine, in the twilight that follows the glow of a red sunset, I saw a goral youth (judging from appearance, a yuhas), followed by a girl of our neighborhood, running stealthily down the ravine, pushing aside the branches of elder bushes, and throw­ing frightened glances behind. They had scarcely gone over the edge of the ravine, following one of the many parallel cat­tle-trails, when a young fellow jumped from behind a spruce, and, facing the yuhas, demanded, "Where to?" They stood for a while motionless, staring hard at each other. There was no parley, no dispute; neither could speak for anger, but they understood each other. Finally, when the yuhas pulled the lass by the sleeve, and attempted to pass, the other flung himself on his enemy with the fury of a panther. Two ciupagas flashed, but soon were dropped, and they then clung tightly to each other. For a while they struggled for equilibrium, then fell down on the broken slate, and continued to fight, silently, as they rolled down the slope from bush to bush. Mud covered their garments and filled their hair, and blood began to trickle over their faces. Some juniper bushes now covered the combatants, and I could hear only heavy breathings and groans. Since they had dropped their weapons in the first mo­ment of the fight, I had not looked for serious consequences; but now I thought it necessary to interfere. Before I reached them, they released their hold. The yuhas with curses disappeared among the spruce-trees, leaving the other panting on the stones with a broken rib. With my help the latter got up, and, slipping and stumbling, limped home. Next morning I saw him lying in front of his parents' house. He never mentioned the cause of his illness, and when old Tereska, who knows the marvelous power of weeds, was called to cure him, she announced, with all certainty, that "Vilkolak" had had him, in their arms. 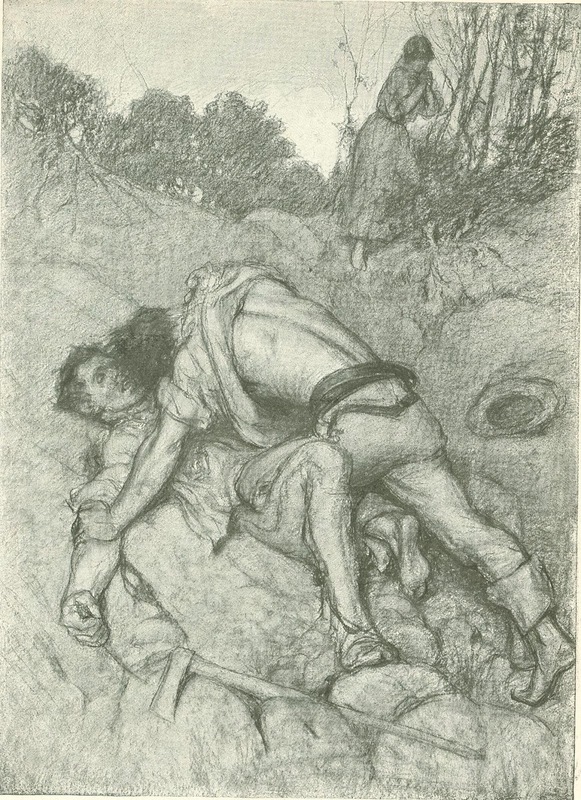 He admitted that it was so and soon all Sobickowa knew that he had been attacked by those terrible, bloodthirsty demons of the woods and ravines. Tereska not only cures people who are troubled with an ordinary illness, but she also knows better than anyone else in the village how to unravel mysteries. Very often a girl, unhappy in love, goes to her with gifts, asking for help in her distress. For the old woman knows where lubczyk, or the love weed, grows, and when and how it should be administered to the re­luctant swain. Another of her accom­plishments is the knowledge of remedies against uroki, the fatal effect that may follow from a glance of an "evil eye." In the Gonsienicowa Valley, where I tarried for a few days in one of the few hovels scattered among its granite boul­ders, I was taken seriously ill. When I recovered from an unconscious spell I found myself lying on the grass in front of the chalet, with fir twigs for pillows, exposed to the warming sun. Some yuhases and shepherd-girls were stooping over me, seriously disputing the cause of my illness. Then all agreed that I was the victim of uroki that some girl had "cast upon me." Against such evil there is only one remedy, and this was immedi­ately used. Maryna, one of the shepherd­esses, brought from her hovel a kettle of water, and three glowing pieces of char­coal, which she dropped into the water. Then with the solemnity due to the occa­sion she walked slowly around me, re­peating many times a few words like a prayer, continually making with her fin­gers some mysterious signs, and watching the charcoal sinking - a sign of recovery. My landlord, Jan Naziom Stopka, was a small man, blind in one eye, solemn and meditative. When he spoke he used few words, expressing his thoughts in some general truth; he had an admiration of nature that verged on the religious. He was accustomed to make weather fore­casts from the hues of the mountains, the formation of the clouds that group them­selves about their peaks, from the flight of birds, and the quality of the air, and he often surprised me with the accuracy of his practical meteorology. One sunny morning I saw him, with his wife and some girls from the neigh­borhood, in the greatest haste gathering some hay they had left near the summit of Gobalowka. 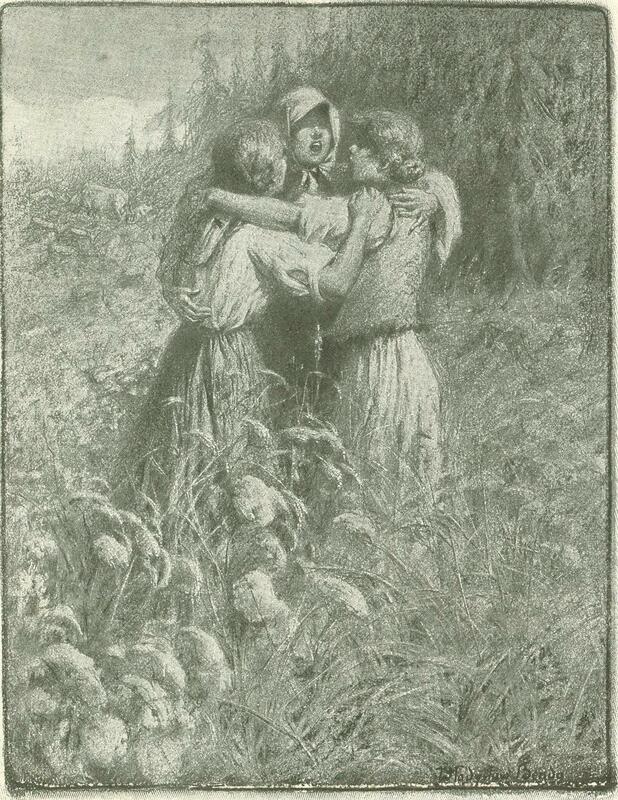 The old woman and the girls gathered the hay in white linen sheets, stooping grotesquely under the enormous bundles that covered them un­til one could see only the edges of their indigo-dyed skirts and their bare weather-beaten feet. When I looked at the bright sky and asked him why this hurry aston­ished at my ignorance, Stopka said: "Why, don't you feel it? We shall have rain today; it will last long. Everything-tells it: Gevont looks so clear and near; the swallows fly so low; and there from behind Muzan come the clouds." And the clouds from behind Muzan came, soon filling the valley, covering Tatra and Zakopane, and obscuring the sky. Then they enveloped our slope with their opaque mass, in which the ravine, the woods, and the houses vanished, and beyond the nearest ash-trees nothing was seen. Rain began to fall, and continued many days and nights. Once for a time the sky cleared, and patches of cliffs and hills were seen. Streams of water splashed from the roofs on the softened ground, and many rivulets rushed down the slopes, and joined in one torrent that washed over the stony road. The girls passed with their cattle wrapped in white linen sheets. Their serdaks were worn with the shaggy side out. At night from the road below came sounds of the wild singing of the goral drivers. Rain, tempest, and hurricane seem to go best with the untamed natures of the young "falcons," as the village lasses caressingly call their boisterous lovers. Tuesday is the weekly market-day in Zakopane. People from all the surround­ing villages come with farm and dairy products to the wide, open square, which has forests and the Tatra chain for a background. From early morning a mot­ley crowd of mountaineers, with wagons covered with white awnings, and with their small cattle and horses, fill the large market space. Men and women bond under huge bundles, and the merchant Jews display in tents orange head-ker­chiefs, calicoes, ribbons, and cowhides for straps and belts. 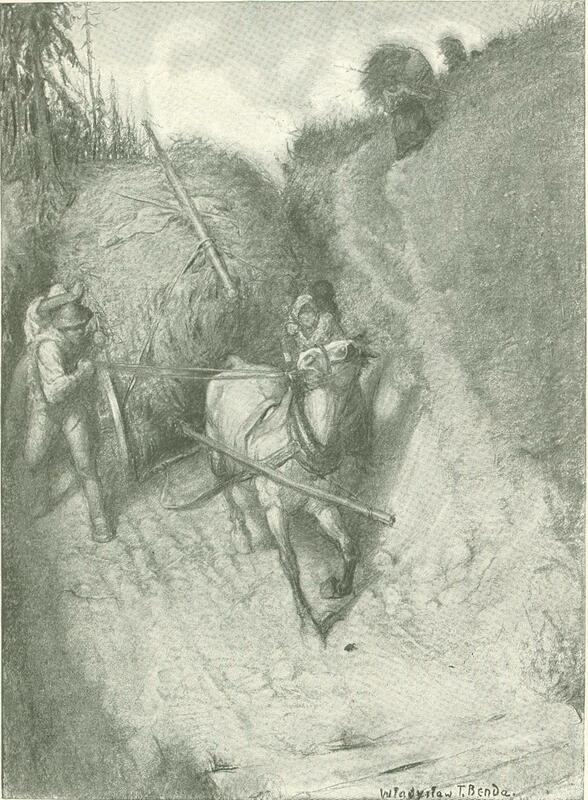 There are stretchers on which are shown scythes and sickles, and a row of wagons with rock salt. Men from distant villages may be distinguished by their different costume. Koscielisko is one of those villages from which many emigrate to America, and in almost every house on Sobickowa there was somebody who either had been to America or intended to go. But there are many villages where the new land is scarcely ever mentioned. The mania of emigration is like a contagious disease, and once it gets hold of a place, it stays there. When my neighbors on Sobickowa learned that I had come from America, they plied me with eager questions con­cerning the land across the water. Most of those who had been in America had worked in the coal mines of Pennsylvania. 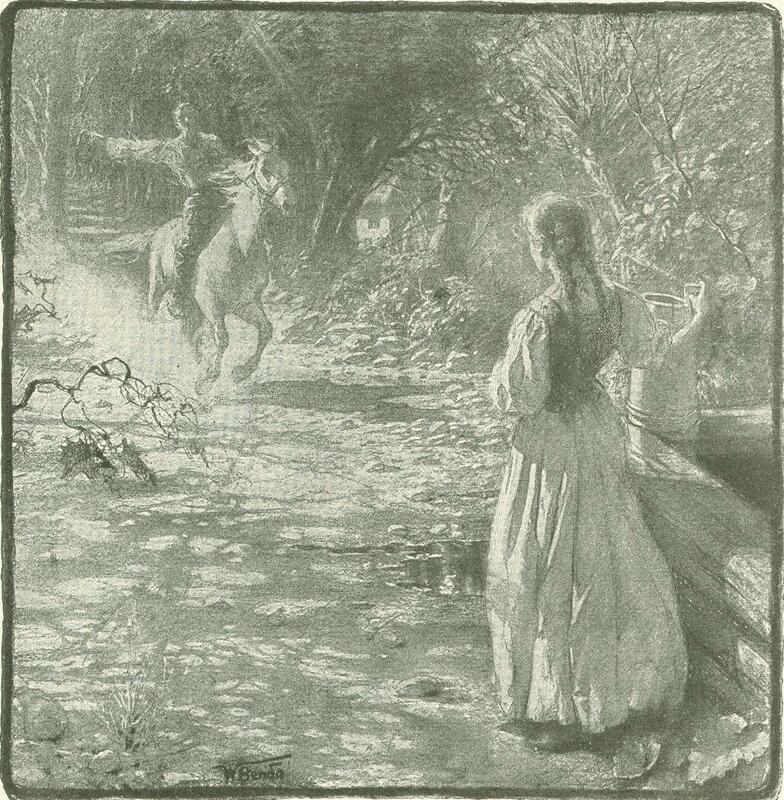 Originally published in The Century Magazine in July of 1908.